As I listened to the Gospel last night, I panicked just a little bit. I kept thinking, "Oh no! He's reading the wrong day!" After speaking with the Deacon after Mass, I still couldn't shake the feeling that I had recently heard the same Gospel. I guess that means that it's good that I'm retaining what I'm reading during the week! After some brief searching, I finally found it on 1 April: Jn 21:1-14. Today's reading: Jn 21:1-19. WHEW! I knew I had already heard it! Peter decided to go back and do what he was doing when he started following Jesus: fish. He did what was comfortable for him. When fishing, most fishermen (being right-handed) cast their nets to the left of the boat. When the disciples did this, they caught nothing. Jesus appears to them and tells them to do something different: cast the nets to the right of the boat. SUCCESS! After that, they realized the person who told them to cast their nets was Jesus. Jesus asks Peter 3 times if he loves Him, to which Peter tells him "yes". This mimics the 3 times Peter denied Jesus. Did Jesus know what he was doing, or what? I thought Peter jumped in the water to get away from Jesus because of his shame or embarrassment for denying Jesus. After I re-read, I realized he jumped in because he couldn't wait to get to Jesus. I've had different times in my life when I couldn't wait to get to Jesus; I couldn't wait to go to Communion on Sunday. In fact, there have been at least 3 times when this happened: First Communion, Confirmation, and after I went on a Search retreat my junior year in high school. Wow. 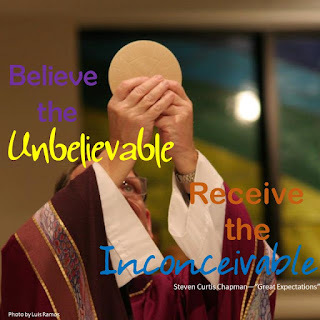 Has it really been that long that I felt that desire to receive the Eucharist? Don't get me wrong; the times I didn't go to Communion during Mass for various reasons killed me. But, am I just going through the motions at Mass? Do I really see Jesus in the host? Do I long for Jesus as I should? Second chance. Jesus gave Peter a second chance by asking him if he loved Him. And Peter said "yes". How many times does Jesus give us chances? Even when we turn away from Him, He is always there with outstretched arms, giving us yet another chance. He is always there in the Eucharist, waiting for us to come to Him. Excellent post. Second, third, fourth....chances. We are always invited back with open arms. What a blessing!